The west coast main line is the busiest mixed-traffic railway route in Europe, and the most important intercity rail passenger route in the UK. 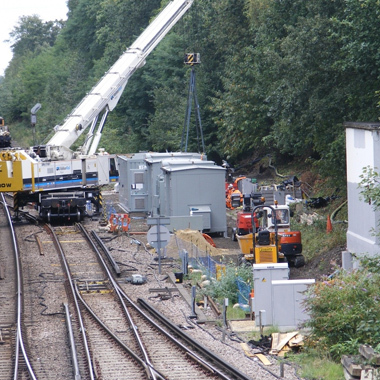 As part of seven figure contract Bradgate were commissioned by a client working on upgrading the line to deliver 9 bespoke switchgear modules, each housing a 25kV Switchgear needed as part of the scheme to deliver increased traction power for the greater number of fast-trains proposed on the route. The modules were specified with horizontal cable entry and varied in length from 11m to 23m. The challenge was not only the module designing and manufacture, but the logistics involved: This project required detailed planning far in advance with the modules scheduled for delivery in stages of 1 module per month over a 9 month period to support the site installation programme. This project made full use of Bradgate’s large facility space. Penalty clauses for non-delivery were severe for both our client and Bradgate so it was vital that they could rely on us, and that we demonstrated the adaptability, experience, skills and facilities to deliver. On high profile jobs with stringent specifications and tight programmes Bradgate have the resources and skills to succeed.